If your dog just can’t decide which flavor she likes best we also offer an assortment of eight of our delicious flavors. If your dog just can’t decide which flavor she likes best we also offer an assortment of eight of our delicious flavors: Peanut Butter, Natural Smoked, Carrot Oatmeal Ginger, Honey Sesame, Apple Honey, Pumpkin Carob, Cheesy, and Cran-Apple. Wonderful to hear Twain Rigby enjoys our treats and is such a loyal customer! We just introduced some new falvors that hopefully Rigby will like as well. 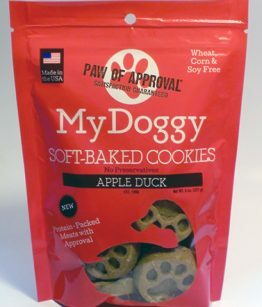 We received an Apple Duck bag in our Bark Box – our 2 dogs (young lab and old lab-mix) were immediately obsessed. They saw where I put the bag, and they circled for a good long time hoping for an extra! Hilarious. 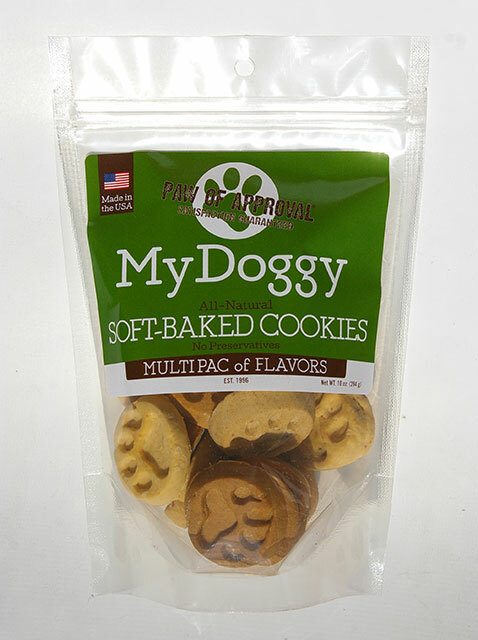 Came straight onto this site and ordered a 5lb bag – I see 2 well-behaved dogs in my future. Thank you!! Thank you for the review! We’re glad you got a chance to try out treats through BarkBox, and that they were such a hit with your dogs. The Apple Duck treats found in BarkBox will be available on our website on October 1 along with our other new protein treat, Turkey Sweet Potato. I hope meanwhile that your dogs enjoy our other flavors. We appreciate your business! My 1 year old Doberman, Apollo received his apple duck treats from his bark box shipment last week and is crazy for the treats. Hands down the best. Thank you for the compliment! We’re glad Apollo like the cookies. The Apple Duck treats, along with our new Turkey Sweet Potato treats, should be ready for purchase by October 1 or sooner. Dusty LOVES these cookies. They do not cause stomach upset, and I feel good giving her natural treats. Wonderful product! I will definitely promote this product. Thank you! I’m glad to hear our treats do so well for your dog. We appreciate that you’d like to promote our product. May I ask, how did you hear about us? Cookie ( Pit Mix) received the Apple Duck cookies in her Bark Box in September and loved them immediately ! Cannot wait to try all the other varieties for her and love the fact they are natural and healthy for her. 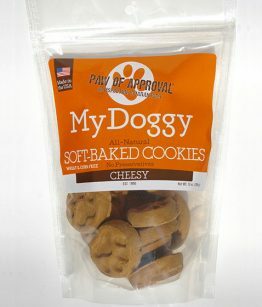 Highly recommend these to all dog owners who want only the best for their dog! Hello. My Cocker Spaniel puppy Brooklyn loves the cookies. We got the cookies from my sister who is into nutrition and natural products. I have already ordered from the website. I would love to see discounts for repeat orders. Thank you for your feedback. I’m so glad your dog likes our treats! Be sure to join our mailing list and check our Facebook page for discounts and giveaways. Please see individual flavors for more detailed information.